I noticed this package in the store the other day. What struck me about the label is where the merchandisers chose to put the product relative to the images. 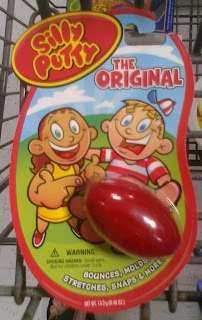 The boy has his hand around the elongated egg of Silly Putty in front of his crotch, and he's holding it out for all to see. The girl is pointing to it, and both have big smiles on their faces. Does this sound like I'm perverted or reading too much into the packaging? Then check out some other kid-oriented products with similar compositions, such as the whacked out/off boy and the happenin' cap'n. Coincidence? You decide. Well, you ARE perverted but that doesn't mean that packaging isn't too. It looks like he's holding it in his outstretched palm. You can't see it too well, but you can make out the thumb sticking out behind the egg.